The proper name for Iota Draconis is derived from the Arabic "Al Dhiba" or "Al Dhih" for Male Hyena, from which comes Eldsich or, more more commonly by the end of the 19th Century, Ed Asich. In the venerable Star Names: Their Lore and Meaning, Richard Hinckley Allen noted that the star was also known in China as "Tso Choo" for the Left Pivot. 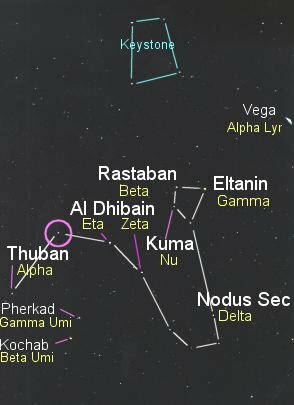 The star lies in the southeastern part (15:24:55.8+58:57:57.8, ICRS 2000.0) of Constellation Draco (see chart and photo), the Dragon -- west of Theta Draconis, southeast of Thuban (Alpha Draconis), and south of the Big Dipper (or Plough). Edasich was Earth's North Celestial Pole Star around 4,420 BCE. On January 8, 2002, astronomers announced the accidental discovery of a giant planet around this star (see UCSD or exoplanets.org press release and graphics, more details below). See an animation of the orbit of this substellar object around Edasich, with a table of basic orbital and physical characteristics. Edasich is a orange-red giant star of spectral and luminosity type K2 III. The star may have only 105 percent of Sol's mass (exoplanets.org) but 13 times its diameter. It has almost 40 times Sol's visual luminosity based on the Johnson Vmag value of 3.29 estimated HIPPARCOS observations during the 1990s, but Robert Burnham, Jr. (1931-93) noted that it had as much as 45 times Sol's luminosity in an estimate made before 1978 (apparently not based on his reported magnitude of 3.30) -- although a dimmer magnitude of 3.5 had been found earlier (Paul W. Merrill, 1922). According to the California Planet Research Team, Edasich may be slightly more (107 percent) enriched than Sol with elements heavier than hydrogen ("metallicity") based on its abundance of iron exoplanets.org, although an earlier reference suggests that it is at least twice as enriched (Cayrel de Strobel et al, 1991, pp. 298 -- and 294 to compare Epsilon Virginis with Sol). It is notable that Edasich has an estimated mass near that of Sol but is more evolved. Although the star may have shed some of its mass already after progressing in the giant branch farther than, say, Pollux, it may be significantly older than Sol's 4.6 billion years. The star has probably shut down hydrogen fusion in its helium-rich core. Edasich is a New Suspected Variable star designated as NSV 7077. Useful catalogue numbers and designations for the star include: Iot Dra, 12 Dra, HR 5744*, Hip 75458, HD 137759, BD+59 1654, SAO 29520, FK5 571, and ADS 9688. 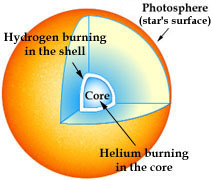 As a star that has evolved out of the "main sequence," Edasich has is shifting from the fusion of hydrogen to helium at its core to the fusion of helium to carbon and oxygen, with trace activity of other nuclear processes. 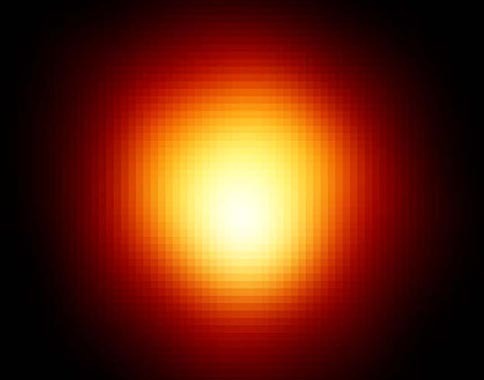 This helium-burning, orange-red giant stage is relatively brief, lasting tens to hundreds of million years (e.g., lasting around 700 million years for a star of one Solar mass). Planet or Brown Dwarf "b"
On January 8, 2002, a team of astronomers (including Sabine Frink, David S. Mitchell, Andreas Quirrenbach, Debra A. Fischer, Geoffrey W. Marcy, and R. Paul Butler) announced the discovery of a giant planet companion "b" to Edasich, at the 199th Meeting of the American Astronomical Society in Washington, DC (see UCSD or exoplanets.org press release, and graphics). The discovery came by accident when the astronomers made Doppler-shift measurements of Edasich while analyzing astrometric reference stars for NASA's Space Interferometry Mission (SIM), using the 0.6 m (24 inch) Coudé Auxiliary Telescope at the University of California's Lick Observatory, on Mount Hamilton in Califonia. Edasich was previously suspected of being a binary star, unresolved by speckle interferometry (Harold A. McAlister, 1978; see note 31 on page 292). planet or a brown dwarf. The object has at least 8.6 times the mass of Jupiter, with a similar diameter (about 11 times that of Earth). 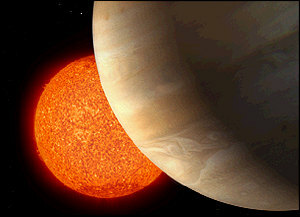 However, because the method of detection relies on radial velocities using the Doppler technique only determines the object's minimum mass, companion b may actually be a brown dwarf. Further work to determine the total mass of this object is planned when NASA launches SIM in 2009. Given the highly eccentric orbit of Edasich's companion b, it is highly unlikely that any planet could have formed in the star's water zone before it left the main sequence. Even if such an orbit were possible, any Earth-type planets that orbited Edasich during its youth would by now have been burnt to a cinder, and possibly fallen into the star from frictional drag with the giant star's gaseous envelope. Astronomers would find it very difficult to detect an Earth-sized planet around this star using present methods. 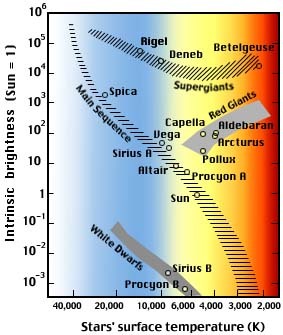 The following table includes all star systems known to be located within 10 light-years (ly), plus more bright stars within 10 to 20 ly, of Edasich. Try Professor Jim Kaler's Stars site for other information about Iota Draconis at the University of Illinois' Department of Astronomy. The late John Whatmough created illustrated web pages on this system at Extrasolar Visions. Up-to-date technical data on these stars may be found from: the HIPPARCOS Catalogue using the VizieR Search Service mirrored from the Centre de Données astronomiques de Strasbourg (CDS); NASA's ADS Abstract Service for the Astrophysics Data System; and the SIMBAD Astronomical Database mirrored from CDS, which may require an account to access.